I almost said winter’s back, but it is about 10 degrees warmer. 50s instead of 40s. The light sitter is one of the resident bald eagles. The closer attempt at a picture was obscured by wet window and a windshield wiper. 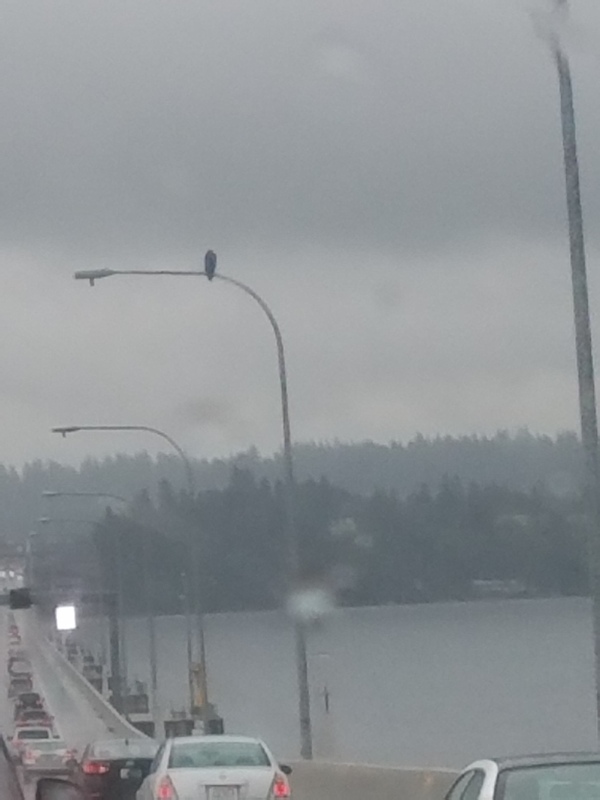 This view is crossing Lake Washington via the 520 bridge. Carl is still under the weather. We made it to Safeco Field yesterday, but left before the game started. The Mariners won with a walkoff home run in the 9th inning. It was Mike Zunino’s second home run of the game. In the other game Carl missed Zunino almost hit one out of the stadium. We may or may not be at the game tonight, depending on how Carl feels. Our neighbor is going with a friends family and Carl was hoping to be there as a guide of sorts. Last night he stayed just long enough to meet another friends friend and introduce them to our seatmate. Carl is in demand. That said we are planning to skip Friday and Sunday games because the Blue Jay fans can be quite obnoxious (and drunk). Carl has plans for Saturday’s game, but I am going to skip the entire weekend. Enough about baseball. Time for work. This entry was posted on June 8, 2017 at 8:09 am and is filed under Uncategorized. You can follow any responses to this entry through the RSS 2.0 feed. You can skip to the end and leave a response. Pinging is currently not allowed.